It is a violation of U.S. government policy to rely on the altered "scientific" reports of the UN IPCC. Greenpeace Co-Founder turned climate skeptic Dr. Patrick Moore commented on the below report: This is the "perfect reason for the US to abandon the UN Paris climate 'agreement'". Climate policy expert Donna Laframboise: U.S. government rules "in no uncertain terms, repudiate the process by which UN climate reports are produced. The US government says political tampering with scientific findings is a violation of scientific integrity. IPCC reports are extensively tampered with by political officials. IPCC reports therefore lack scientific integrity. People who rely on IPCC reports are basing their decisions on documents that have no scientific integrity. Under no circumstance may anyone, including a public affairs officer, ask or direct any researcher to alter the record of scientific findings or conclusions. …personnel will not suppress or alter scientific or technological findings, or intimidate or coerce…others to alter or censor scientific or technological findings or conclusions. There’s nothing equivocal about these statements...I am therefore happy to report that this same government has, in no uncertain terms, repudiated the process by which UN climate reports are produced. By Canadian journalist Donna Laframboise, author of the book, The Delinquent Teenager Who Was Mistaken for the World’s Top Climate Expert. Mere days before he left office, Barack Obama’s Department of Energy (DOE) introduced a sweeping new scientific integrity policy. This matters because the DOE is the largest funder of physical sciences in America, and because climate change is one of its core concerns. Elsewhere, I’ve explained that the new policy is a startling departure from the one that prevailed while Obama was in charge. It seems designed to unleash mayhem. In both instances, however, the DOE was adamant concerning one issue: Politicians should not tamper with scientific findings. There’s nothing equivocal about these statements. When scientists produce a document that says one thing, but their findings get massaged and manipulated by the people upstairs, scientific integrity has been violated. That is the clear position of the US government. I am therefore happy to report that this same government has, in no uncertain terms, repudiated the process by which UN climate reports are produced. In recent years, I’ve written two entire books about the Intergovernmental Panel on Climate Change (IPCC). Tasked with producing authoritative climate change assessments, the IPCC recruits scientists to write these documents. The last major scientific assessment, released in 2013-2014, runs to 7,000 pages. No one has time to read such an opus, so the IPCC also released a Summary for Policymakers approximately 30 pages long for each of the report’s three sections. These summaries were authored by a subset of the scientists who worked on the main report. But the IPCC considers scientists’ own, unadorned words to be a mere draft. Before each summary became an official IPCC document it was extensively altered. By political officials. 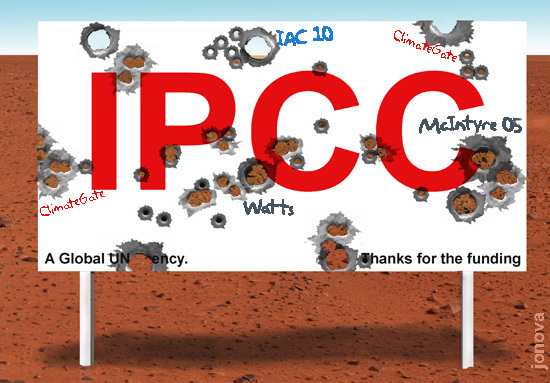 IPCC summary-rewriting meeting. Click to enlarge. Photo credit: http://www.flickr.com/photos/ipccphoto/14108451053/ Image used here in a fair use context. More info here. 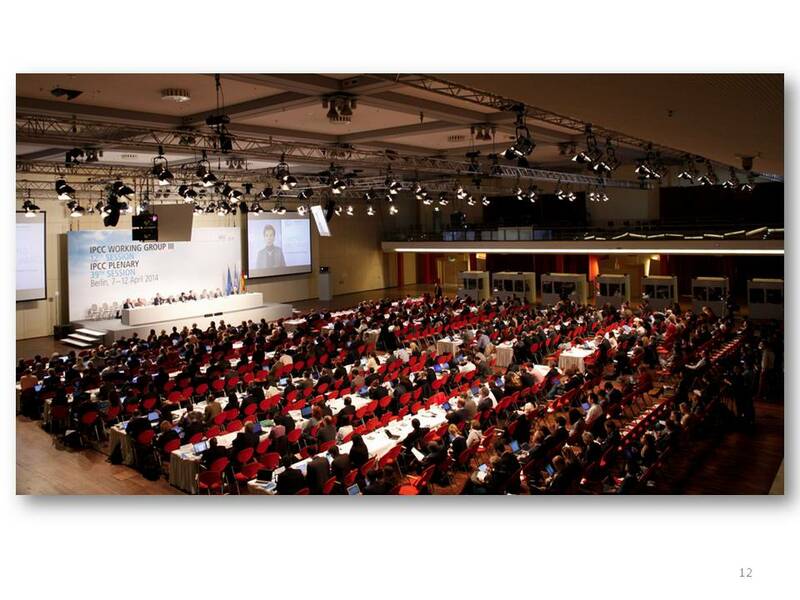 This is how it works: the IPCC convenes a meeting that’s attended by diplomats, bureaucrats, and political representatives from every UN country that chooses to send a delegation. At that meeting, each sentence/paragraph of the summary under discussion is projected onto large screens and debated. Sentences are deleted, phrases are inserted, and graphs and tables are meddled with. Only when every political delegation in the room consents to the new wording is the sentence/paragraph considered final. Then the next one gets projected onscreen, and the political negotiations begin anew. In the normal world, a summary is supposed to accurately reflect the longer document on which it is based. But that’s not what happens here. The IPCC goes back, after the fact, and changes the original scientific report so that it aligns with the politically negotiated summary. The IPCC says it recruits top scientific talent. Those people spend years working on their section of the report, receive feedback from external reviewers, and improve their text accordingly. But what they produce at the end of the day is not, actually, the final word. Click to enlarge. Photo credit: http://www.flickr.com/photos/ipccphoto/14108452703/ Image used here in a fair use context. 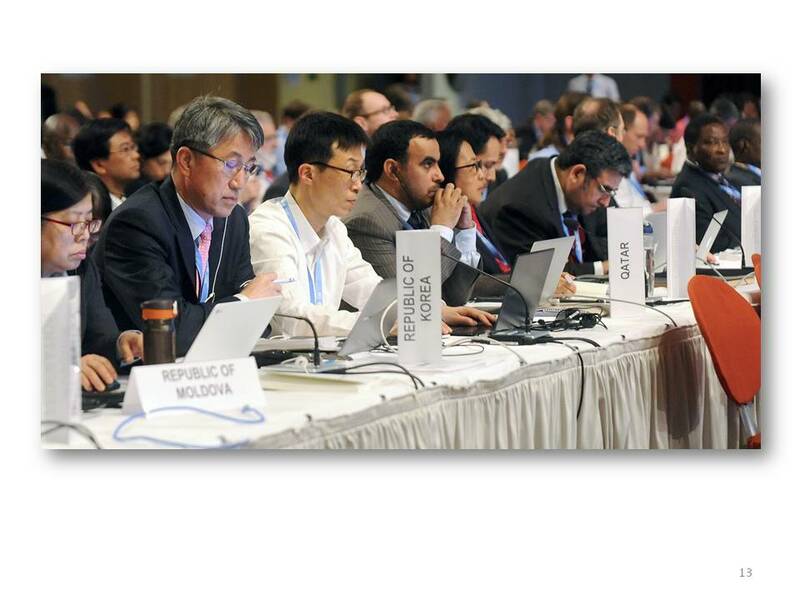 After the summaries are haggled over, the IPCC alters what the scientists wrote. 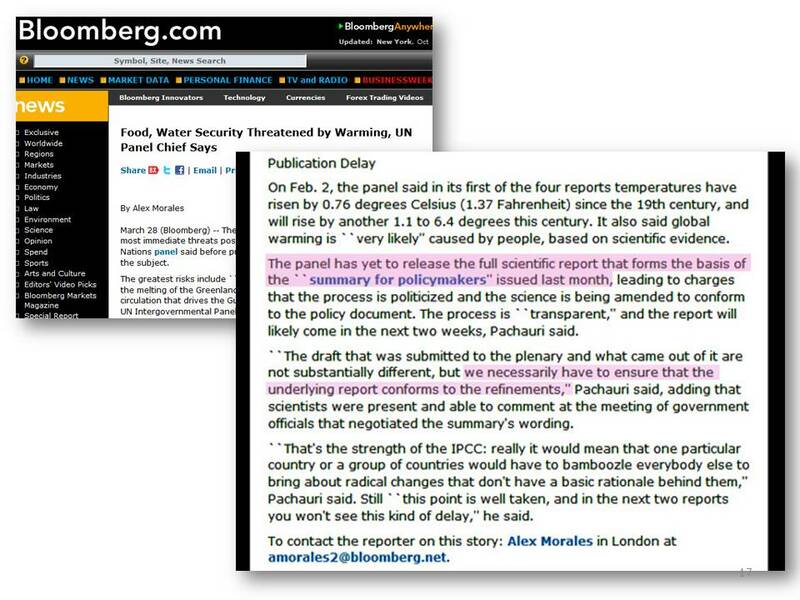 That’s the reason the IPCC routinely releases its summaries before it releases the underlying scientific report. In this 2007 news clipping, the IPCC chairman explains: “we have to ensure that the underlying report conforms to the refinements” (italics added). After one of these summary-rewriting meetings took place in 2013, I pointed out that the IPCC was revisiting nine out of 14 chapters in that part of its report. The list of changes being made to the original report was 10 pages long. The implications here are explosive. Twice in the past fours years the department of the US government responsible for climate research has released a scientific integrity policy. Both versions of that policy forbid the alteration of scientific findings by political officials. Yet this is exactly how the IPCC operates. The US government says political tampering with scientific findings is a violation of scientific integrity. In 2015, during a presentation to the World Federation of Scientists, I discussed this ritualized political interference with IPCC reports. My slides, and a transcript of my talk are available here. What Will Disappear from the IPCC Summary? Warming fears are the “worst scientific scandal in the history…When people come to know what the truth is, they will feel deceived by science and scientists.” – UN IPCC Japanese Scientist Dr. Kiminori Itoh, an award-winning PhD environmental physical chemist.